Hi, this is André, one of the authors of the Matomo (Piwik) Advanced Online Marketing plugin, which has just hit 5,000 downloads on the Matomo marketplace. In this blog post I’ll show you how Matomo AOM improves your data and enables you to make better online marketing decisions. Matomo (Piwik) itself is excellent in tracking all kinds of visitor data, like where a visitor is coming from and what he’s doing on your page or app (pageviews, events, conversions). But what Matomo did not yet take a closer a look at, is how much you’ve invested into your marketing activities and how profitable they are. With the Matomo (Piwik) AOM plugin you can integrate data like advertising costs, advertising campaign names, ad impressions etc. from advertising platforms (such as Google AdWords, Microsoft Bing, Criteo, Facebook Ads and Taboola) and individual campaigns (such as such as cost per view/click/acquisition and fixed price per months deals) into Matomo and combine that data with individual Matomo visits. But although you can access Matomo (Piwik) AOM’s valuable data directly in the Matomo UI for ad-hoc analyses, Matomo AOM’s true strength comes into play when working with the raw data in an external business intelligence application of your choice, where you can further integrate Matomo AOM’s data with your most accurate backend data (like conversion’s contribution margins after returns, new vs. existing customer, etc.). Matomo (Piwik) AOM offers some API endpoints that allow you to fetch the data you need but you can also retrieve it directly from Matomo AOM’s aom_visits table, which includes all visits, all allocated advertising costs and advertising campaign details. As there is never data being deleted from aom_visits, the table can easily be connected to your ETL tool with its last update timestamp column. A third way to get data out of Matomo AOM is by developing your own Matomo plugin and listening to the AOM.aomVisitAddedOrUpdated event, which is posted whenever an aom_visits record is added or updated. Integrating Matomo (Piwik) AOM’s data with your backend data in the business intelligence application of your choice allows you to evaluate the real performance of your online marketing campaigns when applying different conversion attribution models, conduct customer journey analyses, create sophisticated forecasts and whatever you can think of. A company that followed this approach, is FINANZCHECK.de, one of Germany’s leading loan comparison websites. At the eMetrics summit 2016 in Berlin, Germany, I gave a talk about FINANZCHECK’s architectural online marketing setup. Until recently, FINANZCHECK used Pentaho data integration to integrate data from Matomo (Piwik), Matomo AOM and additional internal tools like its proprietary CRM software into Jaspersoft, its data warehouse an BI solution. 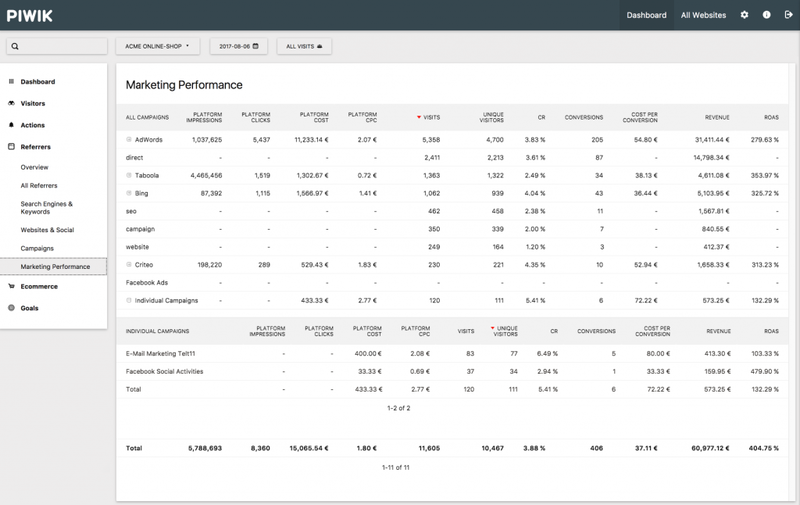 The enriched data in Jaspersoft was not only used for reporting to various stakeholders but also for optimising all kinds of marketing activities (e.g. 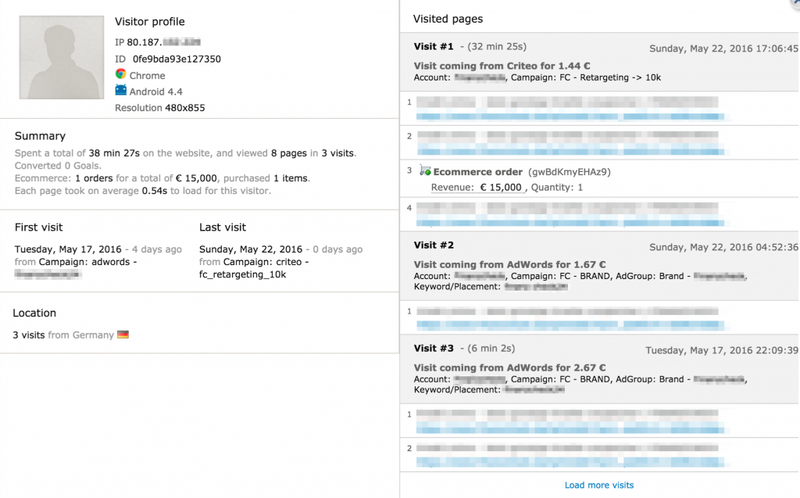 bids for individual keywords in Google AdWords) and proactive alerting. Not long ago, FINANZCHECK started an initiative to improve its setup even further – I’ll hopefully be able to cover this in a more detailed case study soon. In the past, we had the chance to make great progress in developing this plugin by solving specific requirements of different companies who use Matomo (Piwik) AOM. During the next months, we plan to integrate more advertising platforms, reimplement Facebook Ads, improve the support of individual campaigns and work on the general plugin stability and performance. Before installing Matomo (Piwik) AOM, you should know that its initial setup and even its maintenance can be quite complex. Matomo AOM will heavily modify your Matomo installation and you will only benefit from Matomo AOM if you are willing to invest quite some time into it. If you are not familiar with Matomo’s internals, PHP, MySQL, database backups, cronjobs, creating API accounts at the advertising platforms or adding parameters to your advertising campaign’s URLs, you should probably not install it on your own (at least not in your production environment). Matomo (Piwik) AOM has successfully been tested with up to 25k visitors a day for a period of more than two years, running on an AWS server with 4 GB RAM, once CPU and a separate AWS RDS MySQL database. If you have ideas for new features or need support with your Matomo (Piwik) AOM installation or leveraging your marketing data’s potential in general, feel free to get in touch with the plugin’s co-author Daniel or me. You can find our contact details on the plugin’s website http://www.advanced-online-marketing.com. How to get the Matomo AOM plugin? Did you like this article? If yes do not hesitate to share it or give your feedback about the topic you would like us to write about.